The Eastern Carolina Railroaders club are 20 years old this year, and are planning to celebrate with an "open house" featuring all the display layouts that we have operated over our 20 year history. We are pulling old layouts out of retirement for this show and will be running them alongside our modular display layouts. 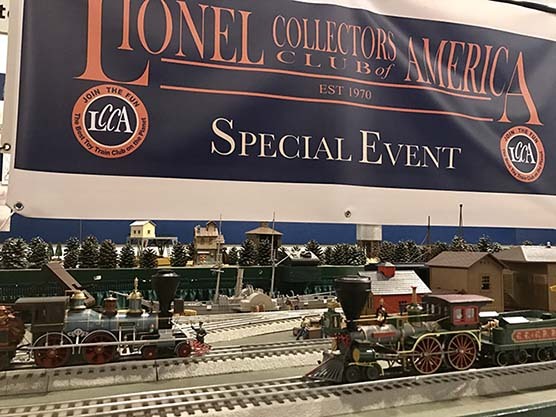 LCCA member David Bjorkman invites all of our members and friends to participate in this FREE toy train event. Come and see their LCCA FasTrack Modular RR layout with many interactive operating accessories. A prewar tinplate layout featuring colorful tin trains from the 20s and 30s. A postwar layout with trains and accessories from the 50s. A Harry Potter layout featuring Hogwarts Castle built from Legos. A Thomas the Tank engine modular layout for kids to run. And, of course, our large modern-era LCCA modular layout running the Vision Line Big Boy. All our layouts have operating accessories that kids (and adults, too!) can operate by push buttons on the front of the layouts. Admission is FREE. A donation jar will be available for all who would like to contribute to help keep the trains running. Location: Winterville Depot in Winterville NC.